Vastu For Shop: In olden days shops run by only one creed or caste, nowadays many has interested to run and maintain shops. On the same way competition also unbelievably double folded. Not only the competition, but many supermarkets or superstores also came into and finally the price war started, due to this huge competition shopkeepers invented many new methods to attract their customers. In this scenario, some were succeeded and some were failed and the failed people changed to some other business or profession. Very pity. To earn money some shopkeepers following wrong methods, like selling the cheap quality items by having a fake brand name, fake items also sold in the shops and finally getting authorities raids and seized shops. Their position is like that, they need to stand in the market, so they are doing such practices and fall into troubles. A profession or business or employment is the most important occupation for everyone life. If there is nothing for a person, how can he live and how can he run his family, if there is nothing settled good in his life, then it is natural that his Family Life may be disturbed, at that moment, his emotions were different. Every man’s success or failure is decided by his expertise, hard work, concentration on only one thing, timely decisions, co-operation from his family members, financial support, personal horoscope/vastu power. His earnings may create value to his life, this is their fate, society is now looking how much a person earned, rather than money, nothing else has got respect in the society nowadays. It's our fat and unfortunate thing. Cultured people always giving respect to the education, not money. There is one proverb says that the greatness of a man’s job or profession is the attraction of a man than his physical appearance. “Exertion is a manly quality.” In Western culture everything they made as a Business, that is why they are looking each and everything with money. The office, shop (Trading Location, a mercantile establishment for all retail sales of goods and or services, a construction of getting income by selling some goods ) or building where we do business or work should be built according to vaasthu shastra. It is to be remembered that most part of our life is spent at our working places. If vastu is followed there, then the office or business will be carried out in a cordial atmosphere and show progress year after year. Business will be successful. If vastu is not followed there, bossism and quarrel among the staff (or servant) and the business will be closed down in due course, getting confusion in many things. Losses in business become inevitable day by day. Whatever be the experience, investment and capacity of the staff or owner, will all wasted. The internal problems become continuous in the establishments. Profits will be affected and unwanted expenditures will become uncontrollable. The Vasthu of a shop or any working place has a direct influence over Man, like that of his house. One should not forget the main point that the living place of a human being is most important in grabbing the vastu results. It influences on his career. Vastu Shastra sincerely working about human beings/residents/inhabitants development. It likes to be an armor to man, in fighting with his struggles in life. Having been born in this world, we have to live purposefully and the living should also be a remarkable one. Everyone should pass a message to the society before they leave this world. We should fight for the achievements. Don't be depressed, fight with the current situations, be brave, always. As we saw earlier, the various natural forces or energies are acting upon man continuously and affecting him spontaneously. Young and energetic men are handsome. But, when they become aged or old, they become hump-backed. Their lovely, fleshy cheeks and their skin becomes dry and hanging over the body..why? The natural forces (example. gravitational force) are acting upon man continuously with the same intensity forever. Man counters there forces by his vital energies and his body becomes healthy and handsome, as long as he is able to overcome these forces. But, when he attains the old age the vital energies are slowly dried up or wasted and he readily succumbs to natural forces and his body drops down. In the same way, natural forces are always acting over man and we have to counter or fight with them with Vaastu forces in order to overcome them and live for a better living. So for a shop, office, showroom, shopping complex malls, Factories or industries etc., the vastu shastra should be strictly followed without doing any mistakes. Even a small vastu defect can lead to huge losses. Hence, it is necessary to know the Vaasthu principles for a shop and other working places. 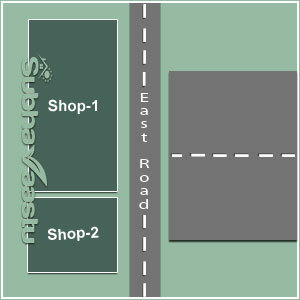 The location and shape of the plot are more important for a shop or any commercial set up. Before taking a shop or buying a shop one should be careful about the compass degrees of that shop and surrounding effects on that premises. 1. The direction of the shop. 2. How many steps to that shop. 3. Where is it located? Is it on the main road or internal inside roads. 4. 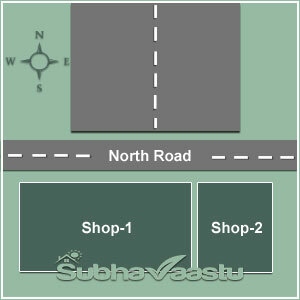 If the shop is facing towards North, then check about East direction shops, South direction shops, and West direction shops. If there is nothing at East direction and other properties are there for South and West, then this will fetch business than expected. 5. Chain Store Marts are different and individual retail outlets are different. Keep it in mind before comparing Vaastu. 6. Most of the people now used to visit Supermarket instead of visiting a roadside shop. If possible try to open a boutique emporium, superstores. It may be little favorable. This has to be decided based on the financial package. 7. Is that property has 5 corners, if so where is that corner, which direction is extended, it should be properly and thoroughly checked? Better to select the rectangular or square shaped shops. If you would like to construct the shop in your same living Home, then it should not come into Northeast corner for East facing and North facing direction houses. For West facing houses, shops should not construct towards Northwest direction side, for South facing homes, deli/delicatessen should not be constructed towards Southern Southeast side. 8. Be cautious when you are planning for the seating arrangement in the shop. 9. Applying color according to vastu for the shop. 10. 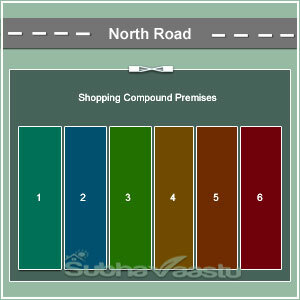 Vastu for shops cash counter, this is most important in shops, when there is attraction, then customers frequently visiting the premises and buying items. Don't empty your cash counter at anytime, there should be some money whether you had business or not, but money should be there in the counter. Don't fill it with unnecessary items and things. Always it should be cleaned properly and make it too clean. Another good idea is show benjamin (benzoin/resin) smoke to the cash counter and shop too. It throws the negative energies from the shop and attracts the positive vibes. 11. The elevation is also supporting in getting more business. For example, if its North facing shop, then one may raise the South direction area to be elevated, then finances will be improved. 13. Planing for extension of your shop. East and North extension is permitted. South and West is not permitted. One should not forget one thing. There is a lot of other things should be counted in this extensions. 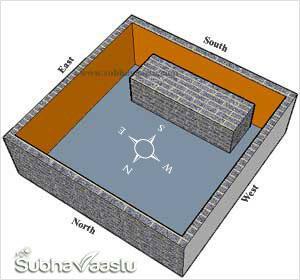 So best to obtain one vastu expert recommendation before taking the extension decision. 14. Some are encroaching. If so, need attention, otherwise, new issues have to be faced. North and East encroaching are good, but West and South encroaching is not a good idea. 1. If more stocks in the shop, people also visiting regularly. 2. When there is empty racks, then buyers don't have interest and never visit repeatedly. 4. If the town or city is hot then arrange one air conditioner in your premises, otherwise, customers never visit again. For example, if a shop in Ahmedabad, it requires A/C in the shop, generally Ahmedabad is hot. Not in Ahmedabad, most of the cities in India maintaining air conditioners in their shops, otherwise customers may not show interest to visit their shops. If the climate is cool, customers can sit more time. 5. There should be more attraction items in the shop. For example, a fish aquarium. When thee is colorful fishes in the aquarium, people like to visit that shop and they are happy to observe the moving fishes. Where should we keep the fish aquarium in the shop as per vastu?. If it is East facing shop then don't keep the aquarium at Northeast corner. 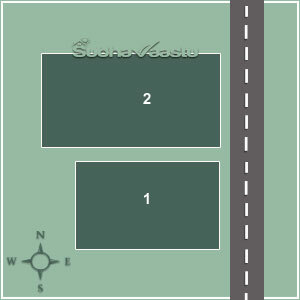 Best to check all things with the help of one vastu expert he will guide the remaining points. 6. Color combination is too important. Ladies and kids like the pink color. Keep in touch with this point. When the shop is too attractive then customers often visiting your property. 7. When there is repeated customers are visiting you, then it attracts other customers and many more will soon visit your property. Once customer traffic increased then automatically, profits will increase. 8. Treatment is most important to the customers. If they feel they are not respected, they may not visit again. 9. Lighting is most important. Please arrange excellent lighting arrangements on the premises. If there is no good lighting then it won't attract more customers. If there is plenty of lighting and eye-catching ceiling fixtures, it attracts more customers. 10. Flooring, this is also the most important feature. Generally, wood flooring is giving confidence while walking on it. 11. Some shopkeepers asking customers to leave their footwear outside the shops, please don't do that, some wear shoes, in such case, they won't have the interest to leave their shoes outside the shops, they don't like to remove and wear again, here, customer is always right, so don't ask them to leave the footwear outside the shops. Only for shops which are selling sarees, exhibiting the sarees on beds which they keep the beds on the flooring, in such shops only wearing footwear and visiting the shop is not good. Further, some officials may visit shops, for them, keep some chairs, they will sit and their family members can buy the sarees, if there are chairs, then allow customers to come inside with shoes. 12. Keeping mirrors in the shop. In some shops, mirrors are must, for example, Gold shops. They need mirrors, max try to arrange mirrors at East, North and Northeast directions. 13. Drinking water. This is mandatory. Please keep one drinking water machine like instant fresh cooling cabinet water dispenser. It should provide hot and cool water. Provide only purified drinking water. Cover the top water dispenser with a most attractive cloth, if shopkeeper giving utmost importance on everything then customers first notice this and they frequently visiting your premises. Your premises appearance presentation is most important. 14. Be in touch with your customers on Facebook, WhatsApp, Twitter, G+ and other social media etc. Nowadays the social media is the most important feature to advertise your products, always be in touch with social media. If possible try to get your customer phone numbers. Some may not provide their numbers, then don't press them again. It may harm their frequent visiting. 15. Smell, the fragrance is important in the shop. Getting bad smells may be a serious cause of lack of customer visits. Here we like to share one instance which happened in the year 1994. We found one Jewelry shop which is in the center of the dry chili shops. When there is dry chili, generally, it produces the unbearable smell and will be very strong. The Jewellery shop cannot shift from that place, it is a very old firm. They installed one electric door curtain which attracts the entire town shopkeepers, most of them came and observing this electric door curtain. Nowadays, this electric door curtain is very common in many shops. It obstructs the outside bad smell and dust. 16. Arrange teak wood chairs instead of plastic chairs, if the chairs look good, people like sit more time and your sales also improve. Don't allow romeos or casanova to sit in your shop while customers buying items. This could damage the customer's privacy. 17. Keep some attractive items in the premises, the customers will repeatedly visit. Buy only the costly items, don't buy cheap items. Buy flower vases, colorful pottery, chandelier etc. 18. Try to arrange one toilet at your premises, but it should be properly cleaned. Otherwise it creates bad impression. Arrange one hand wash, one towel, particularly 2/3 hooks in the toilets and mirror. Exhaust fan is required. How much you are taking importance for your customers, that must be the business in that premises. Your customers should know that you are taking all care. Once they noticed this point, they inform to their friends and relatives to visit. Getting more business with very small investment and care. 19. Sufficient parking space is required, if there is no parking space, customers also not interested to visit often. If there is no parking space in front your premises, then arrange one another location for valet parking. 20. Electricity generator is must. If there is power cut then this genetor will provide power, otherwise customers won't stay more time there. 21. Smile is most important, if smile fails then customers will also fails to visit. Here one shop has elevation at Southwest corner, the elevation is extending towards Southeast. 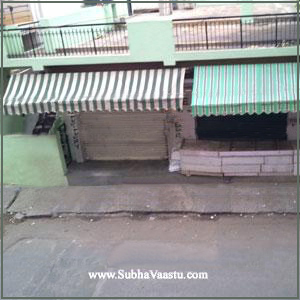 The shop owner constructed a dais or a platform at Southwest corner and it may be extended towards the Southeast corner of that shop, this system is auspicious and getting secured business to the shop or finances may be secured. The platform is constructed at Southwest corner and after that it extends towards Southeast side, if the structure has to be placed like this way then the shop owner will get huge profits, as the platform is extended towards Southeast. Here the land elevated towards South direction or South area. In simple words, the platform may be at Southwest or complete South upto Southeast. When the platform is entire Southwest, South and Southeast then it attracts money, or the money never goes out. With this small correction, the South floor is strengthened and North floor is depressed or down. Where the South is elevated then generally this rule speaks with good profits. Please note that the tenant may not do this correction without Shop owner permission. Some owners accepted and some were not accepted. If the owner not accepting for this correction, then tenants can keep a solid wooden floor and keep the cash counter there or owner can sit there. This article is only for the understanding purpose, it may create a lot of questions, one has to approach one expert Vastu Pandit before doing these corrections. Based on many things we are proposing that one should not do like such correction to their shops. Why?, there is a rule that "TIME", for example, if one Mr. Sasank was taken one shop on rent and done the correction like such a way. His tenure is only 11 months. Within this prescribed period he may or may not see any expected results with this elevation correction. Already we discussed many times about "Time" information, which is published at Vastu Results page. If we never know about this "TIME" secret then some say that vastu is not working, if the same person may follow this process when he has sufficient tenure then "never" say "vastu is not works". 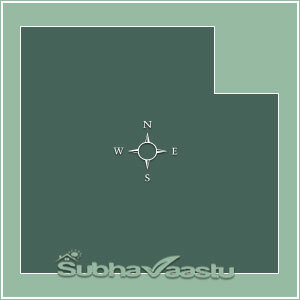 Further, they may inform to their friends too regarding vastu corrections and its working strategies. 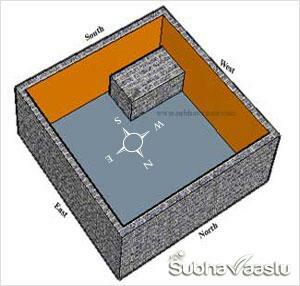 There are many secrets in this vastu science. One cannot understand everything by knowing a few techniques. That is why we strongly suggesting residents please go ahead only with the best expert vastu consultant. When he visited your property, listen carefully and note down his recommendations. If you are really serious to experience the vastu results then follow his guidance points then you will definitely experience the excellent expected results. Forbearance is important here. How much you are co-operating with the genuine vastu consultant who visited your property that much you will succeed with the vastu results. Here the dais is towards South side, this will fetch the business. Please don't ignore that before doing all these alterations, you must consult one expert vastu consultant and take his suggestions and do alterations. You are well aware that surroundings are too important to have good effects on a property. Without knowing the neighborhood Vastu effects on a property, one should not do any practicals on a concern property, otherwise there may be a possibility of getting adverse results. Why we are again and again warn you on property verification with expert vastu specialist means, in shops particularly the North dais also providing with good business, you may believe it or not, but its true. Ancient vastu literature mentioned about weights at North, this is true to believe. Yes, North weights also providing with good results. But how much time it may co-operates may depends on surroundings effects on the property. If there is heavy open space towards North then residents may enjoy the good business more time. In this image the dais or platform is towards Southwest corner, this may help to get more business opportunities and secure the owner in the name of financial support and standard in business, everybody cannot do this correction as most of the shop-keepers are the tenants. Many took shops for rents and running their businesses, at that moment they may plan for the wooden platform, try to arrange the solid wooden or dais filled with wood, with this correction no owner obstruct the tenants. Some owners may not accept if tenant using cement, bricks some other building materials, at that point of time this wooden structures may helps them. We should not forget about North floor elevation, we observed some shops which have North floor elevation has a very good business. Though it may not be permanent, increases good sales. In Pracheena vastu (ancient traditional vastu) North floor elevation brings good business. If your property has such a feature then try to sit/occupy the Southwest and keep the cash at Southwest areas. The shape of the place or site should not be Triangular or irregular or crooked shapes. This will ruin the business establishment. and may lead to closure in within a very short span, even a huge investment also may not support the owner. The Triangular shaped properties like shops, factories, industries etc may not get support from authorities and may lead to closure or struggle with financial issues. A small concern followed with excellent vastu principles and built according to Vastu Shastra principles and supported by surroundings Vastu can easily stand as a name of success and may become a big industry. Some say that in some areas even triangular shaped properties are also getting huge business, how ? the answer is very simple. This is a Triangular Shape shop, it may not grow and finally owner may suffers with many issues and may left the shop with fear. Further, this shop corner point is towards North as the main road is towards North then he may get some business, this business could not be permanent finally he lost entire things including his capital. If you found any shop like this structure is running with good profits, please let us know the total history of the shop. Time frame is important for us to decide the Vastu Results. If the beneficiary is running the business with good profits for a period above of 3 years, then kindly inform us, we will research on the structure and benefits of such shop. Please observe the above and this image carefully, both are triangular in shape, but this shop "may" provide with good business as this is towards Northeast road facing, there is a scope to get good business. In the above image we discussed that the triangular shape is not good, but here we are stating that triangular is giving the good results. The difference is Directions and shape which the shop is faced. Without knowing the directions we should not say predictions of any property. Directions are just like a heart of a human body. 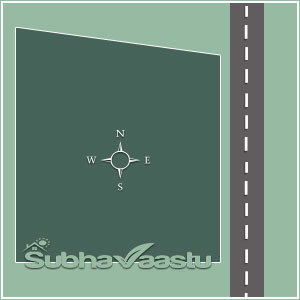 Vastu Shastra works only based on directions. That is why without a compass one should not observe the vastu of a property. Don't forget about the Street focuses to the shops. Some are good street focuses and some are bad street focuses. Without expert vastu pandit advice don't take this kind of street focus properties on rent. Observe the "Shop-1" and "Shop-2" here, these two shops are North Facing and there is one road hitting from opposite direction. The road bestows with good results to Shop-1 and the same road deliver the bad results on shop-2. The street focus is the Northern Northeast Street Focus to the Shop-1 and the same Street focus is the Northern Northwest Street Focus to the shop -2. So keep it in mind before going to buy or rent a shop. 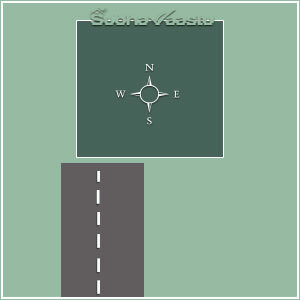 For everything we have to carefully observe when deal with vastu. For each direction street focus is giving different results to the properties. For your kind information, check this image. In this image which shop is good. Please observe both above and this images. In the above image shop-1 is giving good results, here the shop-2 is giving good results. Here the shop-1 may not provide good results. Shop-1 has Eastern Southeast Street Focus and shop-2 has Eastern Northeast Street Focus. Please be careful when a property has street focus. It has to be decided only be expert in this field. Generally, people especially business people look for compliance of vastu principles to their business premises and feel comfortable that now that business premises are vastu compliance and everything will be alright. This statement is partly correct. Vastu influences on the people who are residing, thus the business man residence where he spent most of the times is more important than business premises alone where he spent less time comparatively. This being the case the influence of vastu of the residence outweighs the influence of business premises. We have known instances where business was otherwise running successfully because their business premises are fully vastu compliance but very soon they bit the dust and sold away the premises. On closer examination, it was seen their residential premises where they spend comparatively far more time than on business premises was not at all vastu compliance. Thus the evil influence of non-compliant vastu residence prevailed over these fate of the residence. We don’t need to tell you more than this. The shelves may be arranged towards South, West and Southwest directions only. We observed that the attached shelves to the South and West walls are weakened than the shelves which are not attached to the South or West walls. Here the main important point is that we cannot keep the shelves separately not touching the walls. It won't stand if they do not have support. Vastu is different and convenience is different. Convenience is most important than the vastu. Don't keep heavy load items, articles, goods etc towards North, East and Northeast corners. Shops means, we should keep articles, otherwise, it may not be a selling area for goods, keep it in mind that always avoid keeping the heavy items towards the Northeast corner, better to leave some space towards Northeast, it brings peace to the keeper. When cleaning the shop regularly, start from Northeast and ends at Southwest, please make ensure that there should not be a single dust particle towards Northeast corner. Start cleaning the shop with wet cloth from Northeast corner and ends with Southwest corner or just clean the Northeast area with wet cloth remaining all may be cleaned with a broomstick or dust remover if there is no chance to clean all the area with a wet cloth. Keeping God Photos at business premises is a good idea? Where should we keep the Pooja idols or God Photos at Shops? Keep God photos towards the Northeast corner, don't forget to keep Lakshmi, Ganesha, Saraswathi towards Northeast corners. Photo frames should be more attractive and properly and regularly cleaned. Many experts saying that God photos should be keep only at Northeast, but we never object if photos were kept exactly opposite to the main entrance door. More bigger size more powerful which planned to keep at South and West directions. This is the right place where we need to explain one instance, we visited one transport office which is one of the best in South India at Chennai, they have total 8 photo frames which are all kept at exactly at East direction, they are properly maintained and garlanded. They are not our clients, but we went there for some other work. They are very rich and principled. A format of keeping gods in shops is explained below. Have you observed the format here. If there is only five photo frames in your shop, then arrange Goddess Laxmi/Lakshmi, Ganapahi, Saradamba and remaining two is your interested gods or (Kula devatha). If you have total 6 or 7 frames, then arrange your interested gods in 3 or 4 vacant frames. If God's are respected in a business concern then there is a positive power will also be increased. Observe the below image to get some idea. No big change in the above two images, only garlands are added to the frames, means respecting almighty. Its up to you. Offering daily a bit of prasadam or milk, if nothing is available to you then even keeping sugar are also good idea. Treat them as humans and do perform offerings. Please note that the area which you are going the pooja or photo frames should be very clean, make ensure that there is no dust and bad odors. Light the incense sticks are also good at shops. Light Deepam or pramidha etc regularly. I am Islam Follower (Muslim) can I use Allah Photos at my business area? You may use to hang God Allah photos at your premises. You may place them at Northeast corner using a shelf or directly add to the walls, which ever is convenient for you. Treat photos as God's, respect God photos. Treat them as God's only. You may also do prayers before photos if you require or as per your custom. Vaasthu Shastra is not a belief, it is a science. It is universal following science now. All communities, castes, religion people are now following our olden Indian traditional science, vastu. I am a Christian, can I have Jesus photos at my business premises? Yes, you may use to hang Christian God photos at your business area. Daily do prayer to have more positive power into the premises. Here the Northeast cut is observed, so don't plan to buy or go for rent this property. You may not get satisfaction after some period. We can't guess exact period which the property is giving bad vastu results, but within 6 months inhabitants may understand atleast some negative effects. If you are looking for rental property like this, then wait and look for other properties. If your requirement is only for two or three months, then that is your discretion to occupy it or leave it. It "may" not harm you for "very short periods". We truly suggest you that, if you are serious about any concern then plan to buy/rent a good property then your business will go smooth without hurdles. Our suggestion is very clear, already you wished to buy/lease a shop and spending huge amounts for decoration, style, look, paints, flooring, investment, advertisement, staff etc why compromise on vastu, search for one of the best vastu expert and show the property and then only decide to buy/lease the property, this may be an elderly suggestion for your safety future. Have you any time heard about street focus and their effects on the properties. Mr. Suresh wrote one book particularly on "Street focus and Vasthu Shastra" you may download the sample book from Vastu Books link. This street focus to the shop is called as Southern Southwest Street focus, generally, this property may not provide good results to the properties including shops too. Short while this kind of shops may enhance with the unbelievable profits, but they may not be the continuous, in long term they may lose many things including confidence. Don't select this property, if there is any urgency to take this kind of property then decide only with the help of vastu guru before signing the agreement. Need to express one painful instance. A gold merchant need to take a shop on rent. He find one shop which has Southern Southwest street focus, he called many vastu consultants and finally fix to one quack after paying only Rs.516/- as the consultation charges. After 2 years, he vacated the property with many bad incidences. They came from a reputed family and we don't like to inform their city too here. Once he left the shop, the facts came out that the quack collected Rs.60,000/- for yantras. Actually expert vastu consultants fee is a peanut money when compare with his losses. Can we say an ashamed information here, the same gold merchant wish to start new shop in another area, now he decided to have vastu consultancy, but looking for who is the cheapest in the market. We cannot change the fate of a person. If they had bad time, they are doing like this way only. What is the difference in between 1 and 2 property here. Becareful about 1 here, it may not provide you good results, why because the number 2 property here may obstruct the Northeast positive power to this number 1 property. Northeast North is most important for a successful firm. Have you observed the above one and this shops. Seems to be both are same, a slight difference was observed here. In above image the number 1 shop was not in the line towards "East" direction, now it was came to same line towards East direction, but not in the same line at West direction, due to this, it may be harm to the number 2 property here. Need to observe everything carefully before taking rent or before buying the property. Very small things may also harm in future. Is this a common property or is there anything notable points found here. Hope you have observed the Northern part of the property. Except quacks, no expert consultant may recommend to buy/rent this property. 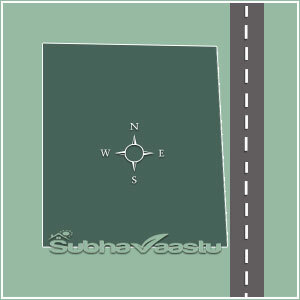 This property has slight extended towards Northwest direction, it means that the Northern Northeast is slightly trucated. In future this property may not bring luck to the occupants. Some head long people say that they know all techniques in this science, but finally they will packup their entire articles kept in these kind of properties after some months. Why? eastern-northeast should not be truncated, this may harm occupants. This has slight extention towards eastern Southeast extension. For long run organizations should not buy/rent this kind of properties, for short term say about 6/7 months, it may not harm occupants, but no guarantee for the time/period. It is hardly required to have some shelter from rain or sun rays in some seasons, require a temporary portico/porch, observe this image, these occupants are using a temporary cloth slanting verandah type sunshades. Temporary means no issues at all, but if you go with permanent sunshades with any material then there may be a possibility for effects. This image properties are South facing. Note that permanent slanting sunshades towards South, West and Southwest may brings bad results. But these sunshades giving good business for North, East and Northeast facing outlets. Life is always challenge. If we plan properly then everything become colourful, without planning every thing may be black and white. No flavors, no enjoyment all unhappy etc. One small idea may brings cheers into your life, one small idea may turn into hectic issues. Why should you face them, Wise decision may always stand you as a leader in your area. Check this image, 1,2,3 may enjoy the life. 4, 5 and 6 may be in trouble, why?. Have you observed the North road, based on that North road all these properties are said to be North facing. The Main Gate is at the center of the entire shopping complex area. For 1,2 and 3 the gate is towards Northeast. For 4th it may not be the Northeast or may not be even North also. 4 also may not be saved here. Regarding 5 and 6 may be getting troubles in the future. Please note that the distance from Gate to shops is most important factor to discuss on this results, if there is a huge distance in between gate and shops then the suffering levels will decrease. Less distance more troubles. Long distance fewer troubles. Based on surroundings we may not predict 100% results for 1st and 6th shop here, the same problem may also apply to all, but now we are discussing only without surroundings/neighborhood influence on this 1 to 6. If you have a choice to select then go for "3" first or "2" as second choice and "1" as the last choice. Hope you understand this image and narration, if not then please contact us, don't hesitate, your safety and security life is important for us. 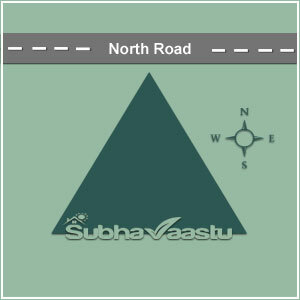 Some people are genuine, some are acting genuine, some are gullible innocent, some are intelligent, some are headlong, some are half knowledge, some are insane, but you are 100% intelligent, yes the visitors of www.SubhaVaastu.com website always intelligent, our visitors are always approaching only specialized expert vastu consultant professionals. They never choose the quacks. In some countries like Saudi Arabia, Oman, United Arab Emirates, Kuwait, Bahrain, Iraq, Iran etc other country people may not buy properties here, the rules are like that. (Israel and Palestine? - we don't have any right information from these two countries and also we don't have any customer from Palestine ). Based on the rules of country, other nationals took the properties only for rent and start doing their own businesses. We have seen many shops in Dubai and Sharjah, Abu Dhabi are only for rent or terms of a contract and was taken by Indians. We have seen one house for monthly rent of 10 lacs of Indian Rupees, yes you are right, you read the correct figure, it's only monthly rent of ten lac rupees. But residents never compromise on vastu, they are searching for a consultant who is taking only 100 AED for the vastu consultancy services. 100 AED means almost its 1200 rupees. After getting strong strike by the quacks, then only these residents approached only experts in this field. Your hard earned money should be spent only in a right way. It should not access wrong paths. Our sincere suggestion for your happy living is buy only genuine company products, approach only an expert in this field, then you never face any troubles in the future. The duplicate items always be cheap and glittering. Don't select them blind, open your eyes and buy only the company released items. Our entire team buy only the genuine company products. We always approach only experts in their fields. When we require coding work, we are looking for genuine and expert, we never see their prices. Start practicing our methods, you never get pains in the future. Generally, people especially business people look for compliance of vastu principles to their business premises and feel comfortable that, business premises are vastu compliance and everything will be alright. This statement is partly correct. On closure examination, it was seen their residential premises where they spend comparatively far more time than on business premises was not at all vastu compliance. Thus the evil influence of non-compliant vastu residence prevailed over these fate of the residence. Some one takes a decision to keep the dressing room in cloth show rooms in Northeast corner, this is 100% wrong placements. What are the right places. Dressing room at Southwest is not good idea. Dressing room at Northwest is good. Dressing room at Southeast is also good idea. If shop has Northeast extended then dressing room can be located at Northeast. If there is parallel connecting stocks then shop keeper can arrange the dressing room at East, North too. The dressing room plaement at South and West are also advisable. How many categories in Shops? 1. Jewellery (Jewelry), Gold, Silver, Gemstones, Birth Stones, Diamonds, Beads, Pearls, Ornaments Sales, Brooches, Bracelets, Ear Rings, Necklaces, Corals, Precious Metals. 4. 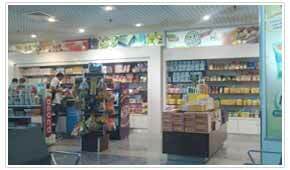 Domestic, Super Markets, Super Stores, Bazaar, Grocery Stores, Kirana, Domestic, Kitchen, House hold supplies, Food stuff Commodities, Business premises. 5. Book Sellers, Pens, Pencil. 6. Musical System, Musical Sound Systems, Entertainment, Home Theaters. 7. Cloth, Ready made, Kids Wear, Children suits, Men Suits, Women Sarees, Matching Blouse, hosiery, Nighties, Punjabi Dresses. 13. Bakery, Ice Cream Parlor, Sweets, Savories, Crispy, Chocolates, Biscuits. 14. Medical Stores, Ayurvedic, Homeo, Pharmacy, Druggists, Chemist. 15. Wine, Beer, Alcohol stores, Liquor, Beverages. 16. Cellphones, Computers, Calculator, Wrist Watch, Charger, Memory cards. 17. Air Conditioners, Fridges/Refrigerators, Air Coolers, Fan, Led/ LCD TeleVision. 18. Iron Merchants, Shelves, Iron Safe, Steel Almira. 19. Coffee, Tea, Hotel, Restaurants, Refreshment Stall, Stores, Chai Mahal, Tea Corner, Center. 20. Banian Center, Under ware, Lungi, Dhothis, Shawls, Sweater, Money Cap, Woolen Cloths, Blouses, Gloves, Socks, Hankies, handkerchief. 21. Sports, Cricket, Tennis, Foot Ball, Chess, Carrom boards. 23. Kitchen wares, stoves, bowls, plates. 25. 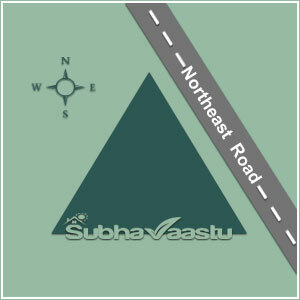 SubhaVaastu.com compass, Materials, measurement tools, engineering tools. 26. Ladies Emporium, Bangles, Gifts and Novelties. 29. Trading Brokerage and Investment concern. 31. Retail and Wholesale counters of all goods. 32. Mattress, Pillows, Bed sheets, Towels, Napkins, Cloth materials. 36. Xerox, Photocopy/ Photostat, STD Booth. 39. Inner Wear, Underwear, Banian centers. 40. Computer Peripherals and there are many more, shortly we will update the remaining list. Which facing sitting is good in my office, how to decide a good office? My cousin Sunil requires to buy a home in USA, is Vastu In USA works? We are planning to construct an periphery wall for our factory, require guidance? How to find directions, many say many things, I am confused, please help to find them? Dear sir, we are looking to buy one shop which has 22 feet at West, 24 at East, 36 North, 31 at South direction, is vastu for shop is OK, shall we proceed to buy this shop. I am going to start a new shop at my home in S-W corner, shop facing towards west. M starting business of women readymade garments shop..i sw one shop with south east facing..I want kn is it good for my business? The north-East corner of the ground, like a new shop.Of land on the north side road.I want to know what kind of business it would be better for the land.